Generally regarded as the first Gothic novel, The Castle of Otranto is also completely absurd. Basically? It's the book equivalent of a hysterical stranger in a velvet suit hurriedly whispering to you from behind a curtain before pushing you down an unending set of stone stairs. Moving portraits! Giant helmets! Eternal melancholy! Let's marry each other's daughters! Thoroughly bizarre and recommended. It's also exceedingly worth reading about. 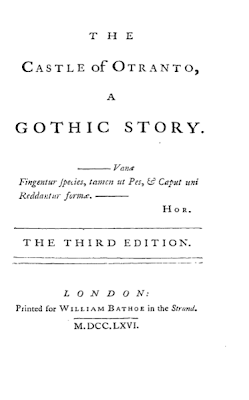 Horace Walpole initially claimed credit as translator instead of author, claiming the story had been translated "from the Original Italian of Onuphirio Muralto."